The WMSI Mobile STEM Lab Unit has been having a fantastic Fall driving around Coos County exciting students about STEM! The past few months have had some particularly interesting updates in student driven coding projects! Students have giggled, brainstormed, and problem solved their way through some imaginative programming challenges, including multi-level maze games, artificial physics games, villain design, scoreboards, and even choose your own adventure story games!! Milan students wiring up game controllers for their new creation! With the basics under their belts, STEM explorers began designing games with different levels. Good games always teach something, so that as you play more your success in the game will increase. Good level-based design will increase the difficulty of each level to match the user's increased skill, creating a game that is never too hard and never to easy. This concept is straightforward in theory, but is a massive task in creative problem solving to balance difficulty levels just right! Students tackled this level-based design challenge with mazes, creating 5-6 maze levels with villains, power-ups, character sensing, and challenging wall puzzles. Looks of concentration turned to grins as students tested and re-designed each other's mazes, creating hours of playing content! Giggling maze antics from these two co-designers! An artistic maze with a cool dragon at the end - Sweet! Our biggest Scratch project of the Mobile program required strong story telling skills as well as some advanced coding! If/then statements, broadcasters, loops, and sensing mechanisms flew in verbal gusts around the room as students tackled the exciting challenge of choose your own adventure games! Three friends hard at work coding a story about a brave monkey explorer! Choose your own adventure games have historically been in either book or computer game format. The basic idea is that your character goes through a story and you, as the player/reader, get to choose what you do from several options. The choices you make decide the fate of your character. In our Scratch choose your own adventure games, students were given the basic coding frame work and challenged to design a story, figure out text and movement patterns for their characters, and given the challenge of using broadcast coding to get the character to cue the scene when to change! Some students took the design challenge a step further, using Makey Makeys to design interactive cardboard board games that controlled their character's choices and movements! The first scene of an adventure game! Should the monkey run away or explore the closed store? Student code sample from a choose your own adventure game! After two sessions, deep looks of concentration and brainstorm faces turned to laughter and excited yelps as students tested each other's games! A 2nd year STEM Lab Explorer sharing his game with the group! A group share at the very end of every project allows students to share accomplishments, tips and tricks, and novel ideas. At the end of our last session each student presented their games, narrating each scene and explaining the challenges they had to overcome. Coding, often considered a solitary activity, is quite fun with lots of friends and colleagues to test your code, program you out of a jam, and pass an excited high five along! Looking forward to seeing what these STEM Explorers dream up next! With school back in session, WMSI's science van, now artistically decked out in fancy decals, is once again touring the North Country, bringing innovative challenges, creative problem solving, and loads of fun to students around the North Country! You can see our Mobile STEM Lab van anywhere in Northern New Hampshire! WMSI Mobile Lab has been edited and shined up in many areas, particularly in regards to our curriculum. WMSI has added units in animation, videography, and robotics, to name a few! We're very excited about our brand new robotics session: Robotic Art Drawers! As we were brainstorming year two curriculum, we got really excited about de-mystifying the 3D printer and making it more understandable for students. a 3D printer is really just 3 motors which allows side to side and up/down movement as well as codes that give the machine coordinates to follow. We simplified this idea to two motors, more basic code, and a marker instead of a plastic melter. The main take away? Machine artistry is fun and we can build these artistic machines without having a Masters in Engineering! After introducing these main points to students, our STEM Explorers raced into the project with enthusiasm and excitement! First, they practiced a skill every designer needs to know: following poorly written blue prints (hmm I wonder who wrote those...). They patiently built, following instructions and thinking critically whenever details were vague or unclear (ok ok, I wrote them!). STEM Explorers designing a sweet gear system for their robotic drawing arm! After building, we talked about another key part of any designer's job: making your own creations through trial and error! 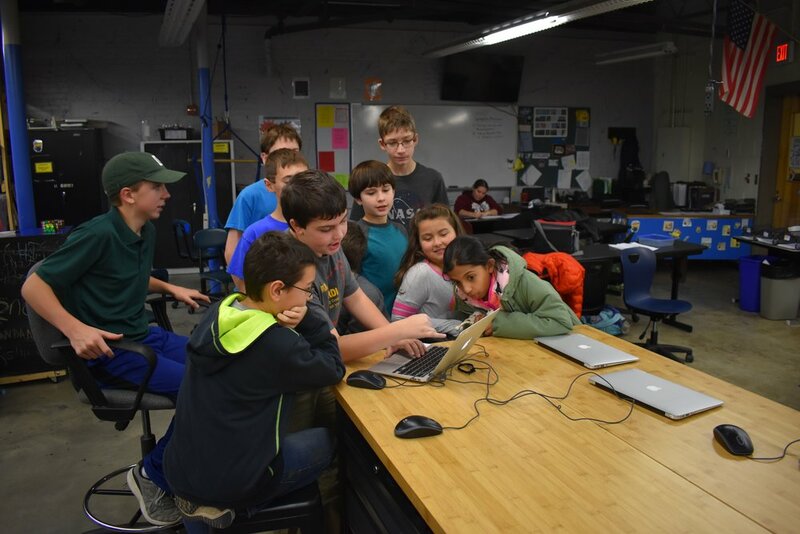 Students fired up laptops and began to code their robots, putting together loops with motor commands that would run the robotic scissor arm of their builds. They next explored different speeds for their two motors and how those speeds would effect their designs. Soon, students had discovered motor speeds that would draw complex shapes such as hearts, skulls, spoons, and the coolest doodles the world has EVER SEEN! Some groups even explored using two markers! Some very excited Youth Leaders putting together the longest scissor arm EVER! "I can't believe my robot just drew that!" All in all, it was a great show of creativity in coding for our STEM Explorers across the North Country! We can't wait to see what these excited students dream up in the coming weeks! WMSI Mobile has been visiting Lakeway School these past few weeks, bringing challenging and fun design opportunities to excited groups of 4th, 5th and 6th graders! This week, we broke out the fruit and circuit boards in an exciting engineering challenge! The missions? Design a fruit piano, and make your own game controller! To play the potato, or not the play the potato. That is the question. STEM Explorers started the day with a demo: a carrot plugged into some electrical wires. These wires were plugged into a makey makey, which in turn was plugged into a laptop. When a student touched the carrot, the computer played a piano sound. Gasps! What was going on? Somehow the computer knew that students were touching the carrot. We challenged students to be Materials Scientists and test other materials in the room that may cause the computer to play piano notes. With grins and giggles students jumped into experimental design, testing carrots, potatoes, scissors, chairs and noses. After testing, we asked students, based to make hypotheses based on their observations about what was going on. The consensus was that materials which were even a little bit conductive (things that have metal or electrolytes, usually) completed a circuit and that commanded the computer to play a piano key. Cool science!! Apparently, noses are very conductive! We then applied this knowledge to the design of video game controllers. We used cardboard, aluminum foil and Scratch games in order to make custom controllers to fit our games! That controller was too big, that controller was too small, but this controller is juuuust right! Soon, students were strumming guitars with aluminum strings, playing Whack-a-mole with conductive hammers, and playing Donkey Kong on classic, home-made nintendo controllers! All in all, an extraordinary show of creativity! We're excited to see what the 6th graders do next week! Want a fun experience this summer? Join our summer camps! Click here to find out more! WMSI Mobile STEM Lab Explorers have begun their final projects of the year. Using the knowledge they've accumulated from previous sessions, they've been challenged with one of our most open-ended and exciting prompts yet! The task is for students to design their own games using Scratch coding, LEGO Robotics, paper circuits, sensors, and Makey Makeys. Games are great, having been used for thousands of years to teach valuable skills, such as speed, eye-hand coordination, reading, and math in an engaging way. What makes this challenge unique is that students are given a very interesting constraint - the game must be part electronic and part physical. Cool! Students began by getting together in groups and brainstorming. They then answered several important questions to frame their game. All good games teach something, so that as you practice the game you increase your chances of winning. What would their game teach? They also asked the important question, "what technology will we use in our game?" We originally were worried about students not having enough direction in this extremely open-ended prompt, but STEM Explorers took off with the challenge, grabbing cardboard, scissors, tin foil, wires, and robotics kits to begin their designs! Explorers endearingly named this game board "The Octopus". Every project involved coding. Some groups in Milan designed and coded board games that had conductive tiles you could land on. Every time a game piece landed on that tile, it triggered the computer code to randomly draw a riddle or challenge that they had to accomplish to move on! One group in Lancaster designed a pattern game (below) with copper tape, a red LED, and a yellow LED. You spin the wheel to get a random color pattern you need to complete, such as "red red, yellow, red, yellow yellow." You then have 10 seconds to correctly light up the LEDs in the correct pattern to move onto the next challenge! The group below designed a board game with different colored tiles. Each color was a different kind of challenge. For example, if you landed on red, you had to throw a conductive ball at a target. If you hit the target, it completed a circuit and prompted the computer code to start cheering! So cool! One student (below) even designed a board game that used a conductive button and a random number generator to perform an electronic dice roll for his game! All in all, students of the North Country again demonstrated their amazing creativity and problem solving skills, and along the way had many grins, laughs, and goofy jokes. Looking forward to see what the STEM Explorers do next week! WMSI Mobile has been busy with STEM Explorers these past few weeks. We've now been facing exciting challenges involving computers. Most computers these days can do amazing things; however, these computers are usually "un-tinkerable". Users aren't supposed to open them or play around with the code that makes them work. Using Raspberry Pi, an extremely cheap, open-source computer, STEM Explorers have been able look at what a computer really is. Not only that, but we've also been able to look at some of the text-based code that helps run our world! The first challenge was to put the computer together by following a diagram, a challenge considering most household computing devices these days are phones and laptops. We then tasked them with a challenge: "find Minecraft on your Pi". Explorers searched away with a gleam in their eyes. Minecraft is, quite simply, the best. On one hand, It is a game of almost pure creativity. With building blocks from a rich inventory of materials, players can make anything from a cabin to a mansion to abstract art. Soon every Pi had miners and builders exploring new places and worlds. Now was the time to unleash the power of coding. Explorers pulled up a program called Python, which is a very powerful text-based coding program. Next, they ran an example program called Megablock. With the magical press of a button (F5), a towering block of lava appeared on their Minecraft screen. No way! A towering block of lava is great, but students quickly saw the value of making cities and mazes using this program. They edited the python code, making diamond, TNT, dirt, and obsidian megablocks of various sizes. Creativity in coding spread like wildfire across the room! After students made 3 megablocks, they got to unlock a new Python program: CastleBuilder. Explorers opened the new program and read through the code. Students then took their code knowledge a step further. They edited the x, y, and z coordinates to change the size of the castle and also changed their water moat into lava. They hit F5. A towering stone structure with battlements, windows, and a moat appeared on their screens. Looks of concentration turned to grins as students explored their new castles, adding beds, windows, libraries, and crafting rooms. What would have taken two+ hours manually was completed in seconds using programming. Coding is so cool! Collaborating over some parkour courses! Here at WMSI, we want to turn coding into something less scary sounding. We firmly believe that anyone can learn to code if they are given small, fun, and achievable steps which progress from simple to complex (sort of like playing a level-based game!). Rather than asking students to write computer programs from scratch, we ask that they read the code, understand it, and edit it to make it their own. At the end of this process, they are rewarded with something cool like a Minecraft castle, which spurs on future coding interest! Next time: how can we create a mini game in Minecraft using loops, random number generators, and megablocks? Stay tuned! WMSI Mobile has been busy this month - we visited 8 different schools in the North Country! Each route color represents a school we've visited once or multiple times in the past month. While adding many miles to our new van, we've been getting students excited about some seriously cool new STEM skills, including sensor programming, game controller design, and Minecraft coding on one of the world's smallest and cheapest computers! During these hectic weeks of engineering and fun, we've been asking ourselves "what are the fundamental components to a good STEM session?" Here's the first idea we came up with. Every set of hands needs something to do. One of the many reasons students loved game controller design was that there was something for each partner. For example, a set of Milan explorers had the unique idea of developing a classic joystick controller. One partner built the box for it while the other partner built the handle. They worked furiously to get it done on time. You could hear fast paced discussions of measurements and placement of aluminum foil as they cut, taped and thought their creation together. One student (left) working on the handle of the joystick, while his partner works on the box to contain it. Another pair designed a controller for a three person game. Each player had an aluminum foil "thimble" around their index finger which, when placed on a conductive pad, made Donkey Kong do something in-game. One player controlled jumping while the other two controlled backwards and forwards. Let me tell you, the team work required for coordinating barrel jumps and avoiding bad guys is pretty amazing! All of these ideas easily incorporate two sets of hands in each partnership, whether the jobs be cutting cardboard, coding, taping, or the act of playing the game itself! Not all of our activities followed this principle of "every set of hands needs something to do". Some of our activities needed a little polishing before they became rockstar STEM sessions. Our third session, musical robots, involved coding EV3s so that different colors placed under a sensor would trigger the EV3 to make different sounds. This activity had a lot of promise but was missing some crucial WMSIcal and STEM design touches. Namely, it was all coding, which meant that only one set of hands was busy in each pair. Many partners contributed ideas, and there was always a keyboard switch every few minutes, but the sharing of the keyboard led to some less than interested STEM Explorers at times. 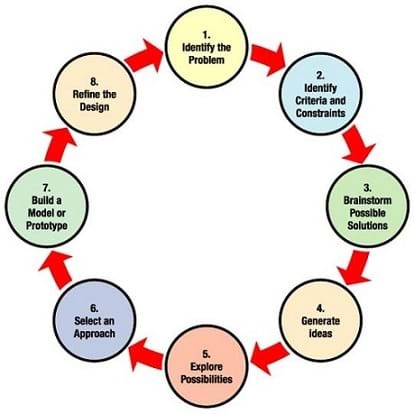 Creating WMSI activities, like any creative task, follows the design process. We identified a problem -- all hands need something meaningful to do -- and tried several different ideas to fix it. The final concept was pretty awesome. "Musical Robots" became "Sound Bots" and the challenge changed from "design a musical instrument" to "design a motion sensor that does something cool and/or useful." Both involve coding computers to create an output given a certain sensory input, but sound bots is far more engaging. Sound bots invite team members to design and build structures, mechanisms, and code. This gives all hands something meaningful to do! Students suddenly had so many things to do! The room buzzed with activities as pairs coded their sensors, recorded sounds that would be activated by motion, and designed cardboard cutouts that incorporated their sensor! One pair programmed and designed a panda that told you its name and favorite pastimes if you got close enough to the sensor. This group designed a girl robot that greeted you if triggered. We even had some door triggered sensors that welcomed you to Groveton every time you walked through a doorway and a birthday cake that sang "happy birthday" every time your head came up close to blow out the candles! Indeed, STEM learning tools are powerful partly because it is highly engaging, both physically and mentally. We've learned that activities which include a variety of tasks (coding, crafting, wiring, etc.) work best for our STEM Explorers. Using these learning experiences, we will continue to hone our STEM adventures throughout the year! Next up, we'll use Minecraft to teach coding, engineering, and problem solving! WMSI Mobile Lab had some electricity in the Lancaster classroom this week! Literally. Now that we've played around with programming robots, we're zooming into the computer by looking at the circuits which make electronics possible! Most students in the room had never worked with electricity before. They were skeptical; nervous - "can you really make art using electricity?" The youth leaders and I reassured them - no chance of electrical shock, we're going to learn the basics you'd need to make your own electrical equipment, and we're going to make art! First prompt? Build an electrical circuit on paper using copper tape. attach LEDs so that light shines onto the other side of the paper. Next, draw art around the light - what's the coolest art you can make that incorporates an LED? Students took off with the challenge! Digging into possibly the messiest art supply since glue: the copper tape. Students quickly made functioning circuits with a + end, - end, and an LED taped onto the conductive side of the tape. They next dealt with the big creativity piece: what drawings look cool with LEDs? Students created houses, reindeer, police cars, and many other cool designs! Rudolph himself never shined this brightly! Next challenge: how can we get multiple LEDs to work at the same time in an art project? The big thing here is that we can't just put one LED in after another. Circuits work a little like baseball playoffs. In the world series, playing 4 to 7 games in a row is exhausting - you have less potential energy in game six than you would in game one. It's the same with putting LEDs in series, one after the other. The sixth LED won't have enough potential energy (voltage) to light up; however, if you have 4 teams that play two games at the same time (in parallel), all 4 teams will have the same level of potential energy (because each player only plays one game). 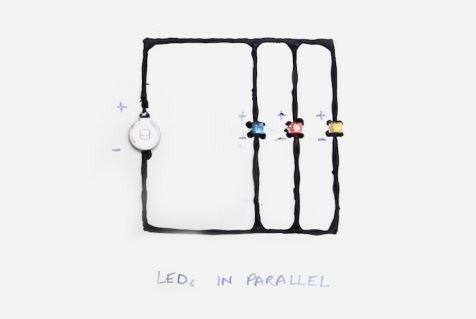 Thus, if you put LEDs in parallel (each light has a different path back to the battery), each LED will be able to light up. Understanding lit up students faces as they tinkered around and figured out the parallel circuit. Explorers drew multistory houses, light bulbs incorporating several LEDs, and their names with the I's dotted with LEDs. One STEM Explorer quickly discovering the secrets of the parallel circuit! One student even developed a switch in his circuit that allowed his police car's lights to blink! Mrs. K, an outstanding Lancaster teacher and our Onsite Coordinator for the school, has done some cool projects making stained glass using copper tape. She had a lot of useful tips to share with students (below). Mrs. K helping students diagram their electrical circuit! We ended on a high note as Explorers excitedly pulled their parents into class to show them their creations! Next session's challenge? Let's test out conductivity by making keyboards out of fruit! WMSI is back from holiday break filled with excitement about programs for 2017! Specifically, I've been putting thought into how our sessions work. Should they follow a rigid plan? Should they be flexible, allowing students to drive learning forward through creativity? Both approaches have their merits, but if you have a truly engaging learning tool, letting student creativity power progress can lead to loads of fun! During our musical robots sessions, students did just that! We started by explaining the engaging tool: a LEGO EV3 computer with a distance sensor and a color sensor attached. On our laptops, we had software in which we could code different sounds to different colors or distances. The framework was set. what could students do with it? Students brainstorming with one of our outstanding youth leaders! Students started with a fairly easy challenge: program the distance sensor so that volume is related to distance measured. STEM Explorers took off with this prompt, creating police siren like calls as well as howling dogs that increased or decreased in volume. One pair danced in front of the sensor, causing the computer to produce different sounds depending on how far away they were! The big design challenge of the day? Use the color sensor to produce something fun. Students drew information from their previous, more structured challenges to follow their curiosity with this open-ended prompt. Some students "attached" a word to each colored block, so that when they flashed red under the sensor the output said "Luuuke." they pushed the red away and inserted green - "I am". Lastly, they used blue - "your father". Movie quotes filled the room with giggles. A STEM Explorer adding a custom sound. A couple sets of students used the custom sound recorder on the LEGO software to record random words. They then coded the words to different colors, which allowed them to make random sentences. They called it "The Mad Lib Generator". This gave me an idea. I talked to the students some more about their generator and decided to act on the idea. With the help of Bill and our youth leaders, I created a madlib LEGO program that would draw from a random bank of nouns, verbs, or adjectives depending on which color was under the sensor. This code generates a random number. The number range it can generate depends on what color is under the sensor. A random number triggered by the red block will choose one of three nouns added by students. for our next music bots session some students got to beta test the program, adding their custom nouns, adjectives, and verbs into the word banks. They read a Mad lib that I printed and used the program to fill in the blanks. Not only did they love the program, but it also gave them the chance to explore random number generators and variables in the LEGO code! This novel idea would not have been possible without STEM Explorers driving the creativity of our Mobile Lab sessions. Some students having a blast with mad libs! Hard Fun in Berlin and Whitefield! Mobile Lab brings coding to the next level with musical robots at Berlin and Whitefield! STEM Explorers have hit the gas pedal on creative design this week! The WMSI Mobile unit recently visited Berlin and Whitefield, bringing a simple free build prompt to students: build a robot that moves without using wheels. Some thought it couldn’t be done, but students outdid themselves in another week of fantastic creative problem solving! One amazing part of Mobile STEM Lab is that we get to see how different groups of students handle the same problem, highlighting the old saying, "there are many paths to achieve the same goal." Many Berlin students took off with our challenge by modeling their robot after an animal's movement system. One group focused on how a spider moves, with several long spindly legs. Somehow, in a 50 minute period, they incorporated 4 motors into their design, coded them, and had the device dancing around the table! (below). "it moves more like an inch worm than a sloth!" "No way - that's so cool!" the "sloth" ended up having a movement system that looked similar to train gearing, giving it an inch worm like movement. Of course, the Youth Leaders had a blast too, not just giving the students great advice but also doing a build of their own! the Youth Leaders showing off their design skills! In Whitefield, students took an entirely different approach. they wanted to make a robot fly like a bird! We discussed the power to weight ratio needed to achieve flight. They switched their design to "what's the simplest way to achieve a dancing robot". Sometimes the simplest answer is the best one. Other students went for the double wind mill approach. One student designed a race car but with turning arms instead of wheels. He then coded it to go five rotations forwards and then five rotations backwards. on a loop. FOREVER. Slap a solar charger on that build and it would still be running! Finally, it was time to rev up the motors for one final group dance party! This was capped off with Whitefield's very first exploding robot. Shrieks, giggles and merriment were had by all! WMSI STEM Mobile Lab wrapped up spin art sessions around Coos County with a strong showing of excitement and innovation from our STEM Explorers! Arriving in Berlin, we were thrilled to see the smiling faces and minds ready to engage. One student said to me, “robots. Did you say we’re building robots?? Hey mom! I need to tell you something! Jeremy said we’re building robots!” She excitedly ran off to tell her mom. This story sums up our spin art well and highlights what we’re trying to do at WMSI: excite people about creative problem solving. Some students tried out using one color and creating zoom patterns. Other students went for more of the color explosion approach! (below) Several explorers had the idea of putting down two or three markers at once onto the spinner, creating a very symmetrical rainbow pattern! Three Whitefielders stepped spin art up a notch and turned their project into an “art launcher”, sending a piece of paper skittering off the desk. Giggles were had by all. We wrapped up spin art in Gorham with an excited bunch students and Youth Leaders! Five of Gorham High School’s most innovative inventors showed up to help the STEM Explorers, bringing knowledge, patience, and some well deserved goofiness! Gorham students were particularly interested in color blending, using similar shades to create vortexes and swirls. Artsy! One group dove into coding, making a complicated spin pattern using loop, wait, and power functions. Cool! This group below combined spin art with some astronomy and used the robot to make a model of a solar system! At the end of each class we all gathered around and talked about our next session. The new challenge? You must build a LEGO creature that moves; however. you . Can’t. Use. Wheels (Gasps!). We’’ll see how they do after Thanksgiving! WMSI Mobile STEM Lab Launches! Today’s very first WMSI stem lab started off with a fire of excitement and enthusiasm which will be a trend in the coming months. Students showed up to Mrs. K’s classroom in Lancaster buzzing with excitement and wondering what cool projects they'd work on with WMSI today. Our first challenge of the year was to build a robot that could make art. Concept-wise, we hoped to teach how gears work, basic programming, and good old creative problem solving. Our youth leaders, John and Ansen, passed out the LEGO pieces and the build was on as the temperature of the room slowly rose with the heat of 17 brains hard at work! Once the robot was created (a gear attached to a motor that rotated some sweet octopus-like arms, which held a white sheet of paper), all we had to do was program it spin in different patterns. Looks of concentration turned to grins as markers met paper and art time began! Overall, it was a huge success with two thumbs up!